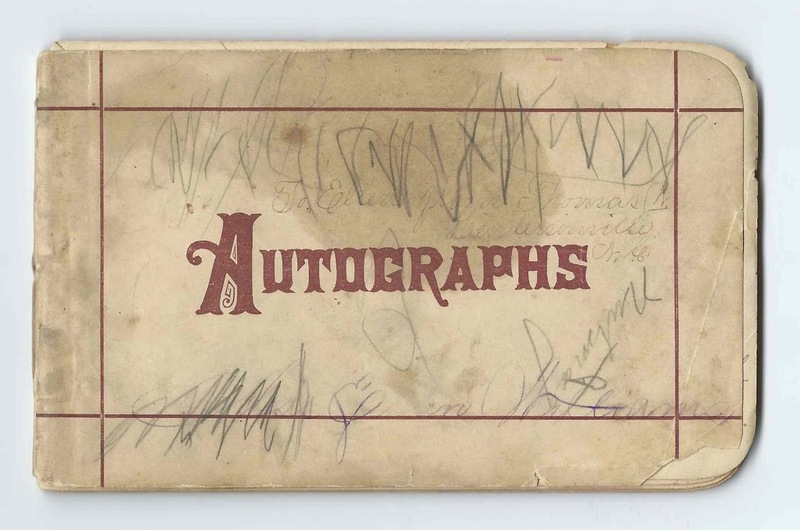 1889-1893 autograph album that belonged to Susan Birdie Crice, "Birdie", of Ballard County, Kentucky. 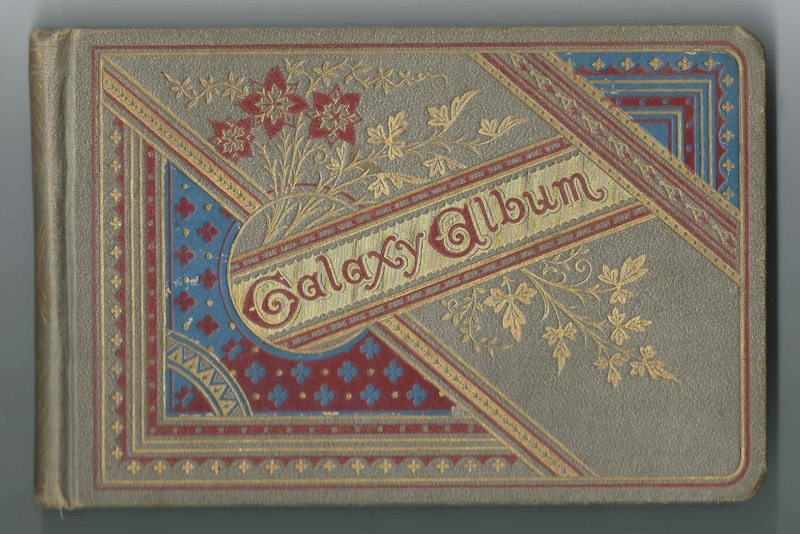 She bought the album on November 7, 1889, as you can see from the image below. 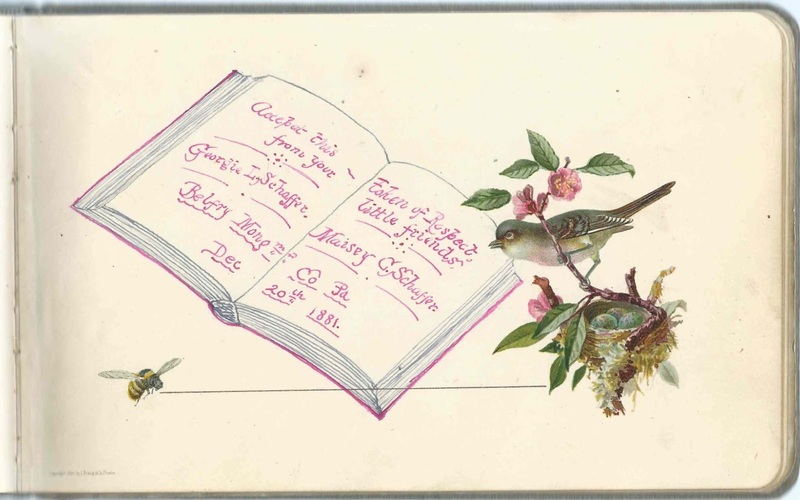 The album measures approximately 7" x 4-1/2" and contains the sentiments of 42 of Birdie's relatives and friends. An alphabetical surname list and an alphabetical list of the signers, together with any personal information they offered, appear at the end of this post. Susan Birdie Crice was born March 1, 1873 in Ballard County, Kentucky, the daughter of Frederick W. Crice and Mary Sue (Swearingen) Crice, who were born in Ballard County, Kentucky, and Shelby County, Kentucky, respectively. 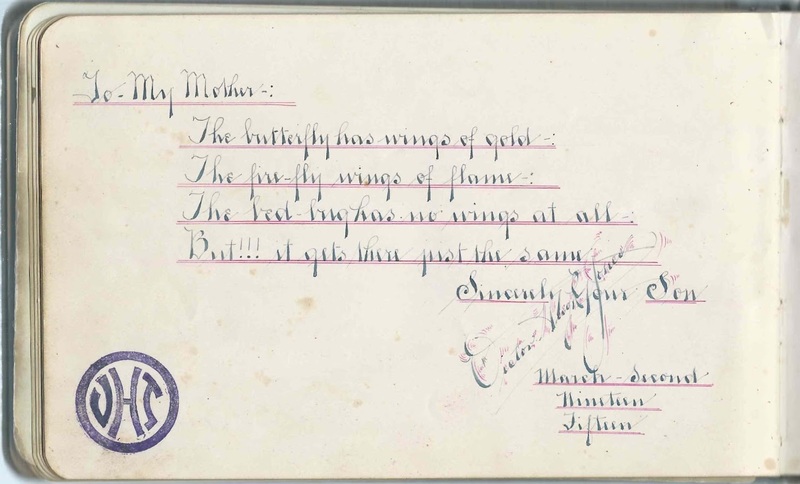 Birdie's father inscribed a page in her album on December 6, 1889. 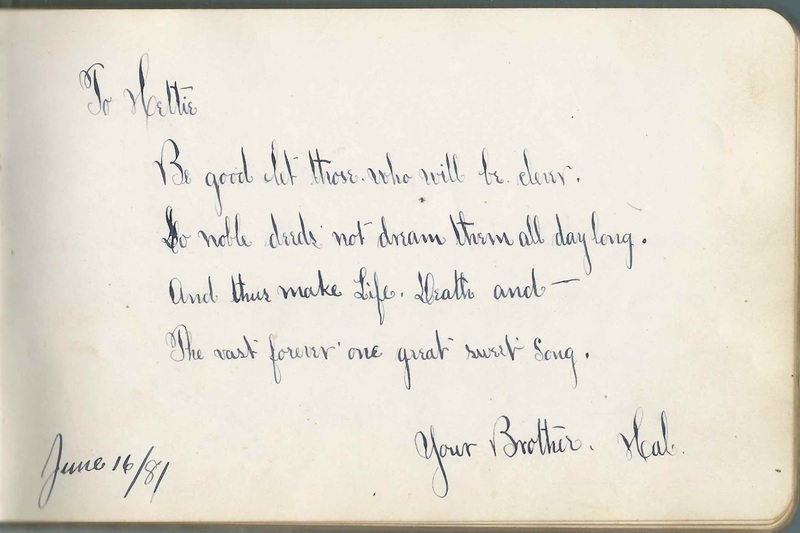 Two of Nellie's brothers and a sister inscribed pages in her album. 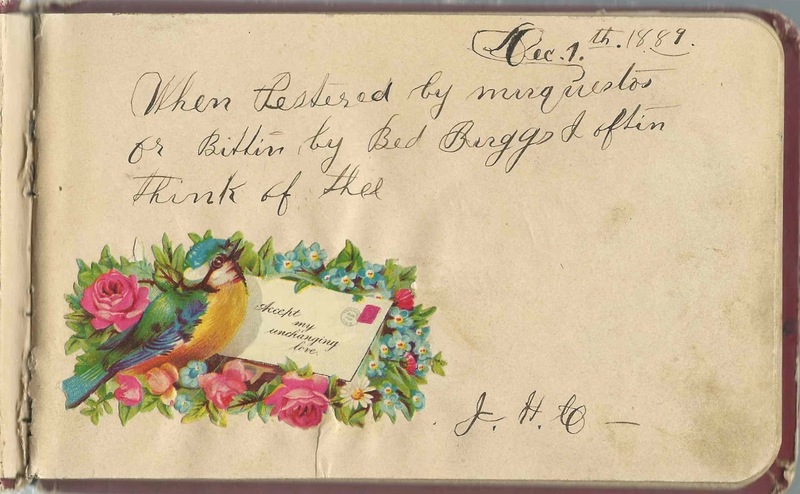 The J. H. C. who inscribed a page in December 6, 1889 was presumably Birdie's brother John Harmon Crice. 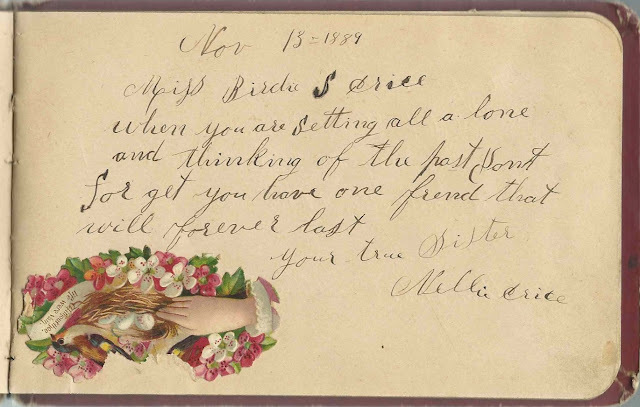 Birdie's brother Willie E. Crice inscribed a page on November 17, 1889 to his "Darling Sister". 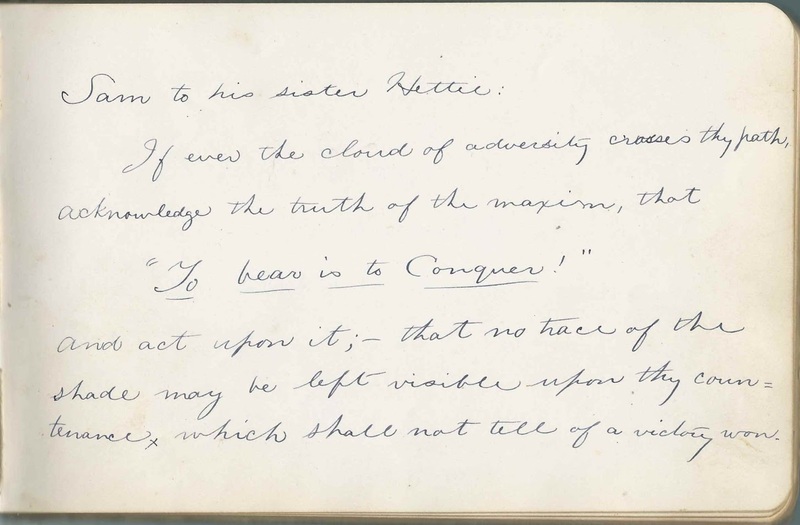 Birdie's sister Nellie A. Crice inscribed a page on November 13, 1889. Several cousins inscribed pages: Maggie; J. E. B.; Willie Gatewood; Eliza Gatewood; Bettie G.; H. W. M. [not sure of surname initial - could be W]; Alice Terry. There may have been more who didn't express a relationship in the sentiment they left. On October 6, 1897, Birdie married Oregon native Samuel A. Oliver and settled at Pendleton, Oregon with him. They had two children, son Samuel A. Oliver and daughter Nellie Oliver. Samuel, Sr., died in 1926. Subsequently, Birdie married Charles F. Schwald. She died in 1947 and is buried at the Olney Cemetery at Pendleton, Oregon, with her first husband Samuel. H. J. or H. I.
Willie E. Crice, inscribed on November 17 1889 to his "Darling Sister". Birdie's younger brother William E. Crice. Cousin Bettie G.; shared the page with Anna Rollings or Bollings or ? Anna Rollings, or Anna Bollings, or ? ; shared the page with Birdie's cousin Bettie G.
1886-1894+ autograph album that belonged to Ella Dorn Williams, "Ellen", of Hendersonville, North Carolina. There are three later undated entries by her daughter Mabel Acker, who was born September 28, 1898 in Pickens County, South Carolina. 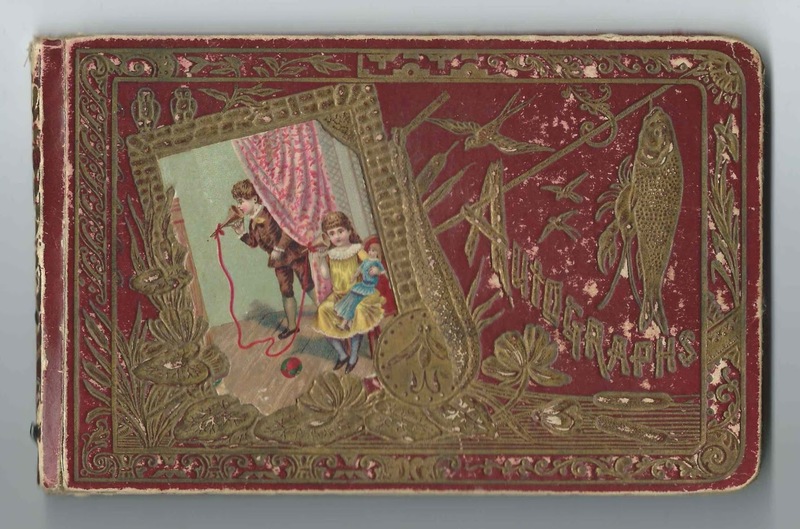 As you can see from the image above, the album was given to Ellen by a Thomas of Hendersonville, presumably her brother Thomas Clingman Williams. Mabel wrote her name upside down on two pages and also was likely the author of a page listing her name and the name of Mrs. Waco Acker, who would have been Ellen, the album owner. The album, which is missing covers and spine, measures approximately 6" x 3-3/4" and contains the sentiments of 24 of Ellen's relatives and friends. An alphabetical surname list and an alphabetical list of the signers, together with any personal information they offered, appear at the end of this post. One of Ellen's children or grandchildren, presumably, scribbled throughout the album. Ella Dorn Williams, "Ellen", was born March 28, 1868, at Hendersonville, North Carolina, the daughter of Leroy Taylor Williams and Elvira Andrew (Banning) Williams. Ellen had another brother, James Ott Williams. 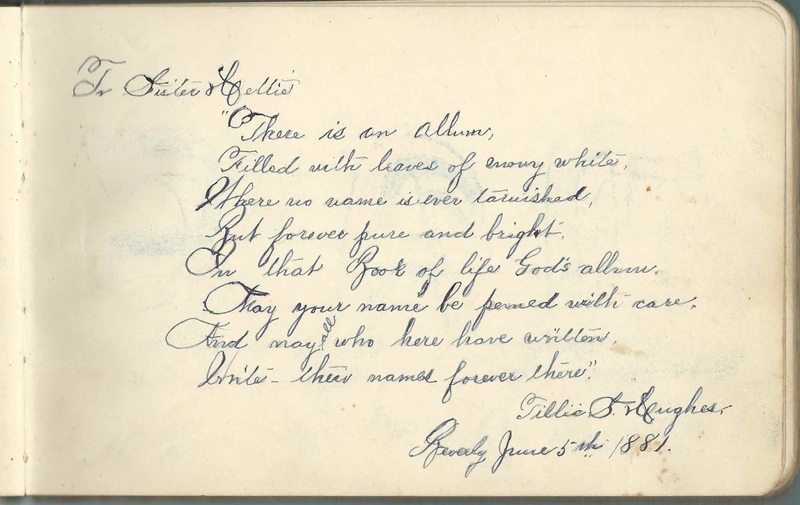 Four of Ellen's cousins inscribed pages in her album. 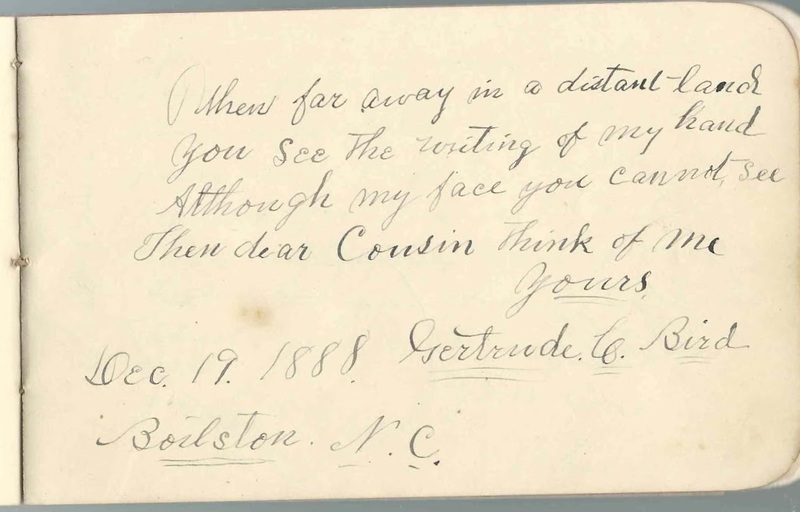 Cousin D. R. Murray signed a page at Boilston, North Carolina, on March 23, 1894. Cousin Fannie inscribed a page. Cousins Gertrude C. Bird and Lou Bird inscribed pages at Boilston, North Carolina, Gertrude on December 19, 1888, and Lou on July 19, 1887. On January 15, 1896, Ellen married James Waco Acker, son of Joseph Jasper Acker and Nancy Caroline (Sitton) Acker of Anderson County, South Carolina. Ellen and James Waco lived for a time in North Carolina, South Carolina and Georgia. They raised at least two children, son Louie Dorn Acker and daughter Mabel Acker. Ellen died in 1946 and husband James in 1949. They're buried at Silver Brook Cemetery at Anderson, South Carolina. One signer had an unusual name, which he understandably abbreviated in most of the official records. He was Volney Condorcet Voltaire Shepherd, who inscribed a page on April 3, 1889, and stamped his name on another page. Hattie; can't make out what might be her surname initial - possibly J.
Unsigned, at Boilston, North Carolina, on July 30, 188 [no last digit]. There might have been a short name but it appears to have been rubbed out. Gertrude C. Bird, signed at Boilston, North Carolina, on December 19, 1888; Ellen's cousin. Her mother was Mary Jane (Williams) Bird, a sister to Ellen's father Leroy Taylor Williams. Lou Bird, signed on July 19, 1887; Ellen's cousin Louisa Bird. Her mother was Mary Jane (Williams) Bird, a sister to Ellen's father Leroy Taylor Williams. Birt Crawford or Birl Crawford or ? V. C. V. Shepherd, signed at Hendersonville, North Carolina, on April 3, 1889. Volney Condorcet Voltaire Shepherd. He also stamped his name on a page. Ella Dorn Williams, "Ellen", of Hendersonville, North Carolina; album owner. She received the album from a Thomas of Hendersonville, presumably her brother Thomas Clingman Williams. 1881-1936 autograph album of Henrietta Matilda Hughes of Beverly, New Jersey, and, after her marriage to John Hugh Jones, Philadelphia, Pennsylvania. The album measures approximately 7-3/4" x 5" and contains the sentiments of 90 of Henrietta's relatives and friends, including, during a later era, her children and grandson. An alphabetical surname list and an alphabetical list of the signers, together with any personal information they offered, appear at the end of this post. 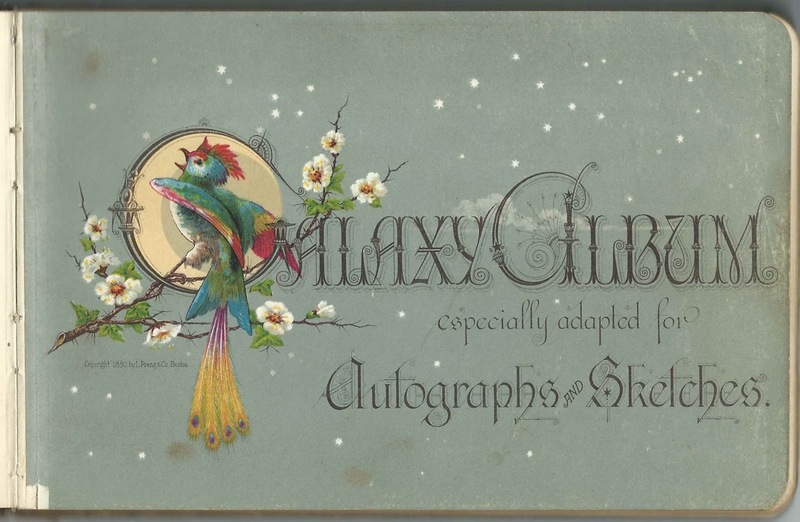 Many of the pages have preprinted illustrations, which many signers used and even enhanced, i.e., the page signed by Georgie L. Schaffer and sister Maisey C. Schaffer of Belfry, Pennsylvania, who inscribed their page on December 20, 1881. Their parents also inscribed pages: Methodist Episcopal minister George L. Shaffer and H. E. Schaffer, who was Hester Eliza (Gwynne) Schaffer. Henrietta Matilda Hughes, "Hettie" or "Henny", was born May 30, 1857 in New Jersey, the daughter of John and Sarah (Boulter) Hughes, who were born, I think, in Wales and Barbados, respectively. At least two of Hettie's siblings were born in Barbados before the family moved to New Jersey. 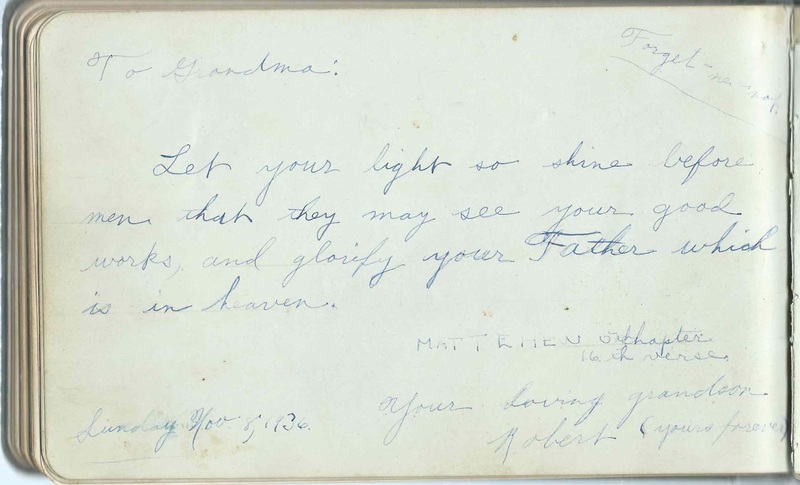 The page below was presumably inscribed by Hettie's father, John Hughes. Hettie's oldest sibling, sister Sarah E. Hughes had died in 1876, before the album was started. Brother John B. Hughes and, presumably, his wife Lizzie G. (Lobb) Hughes of Philadelphia, Pennsylvania, inscribed pages in May 1881. 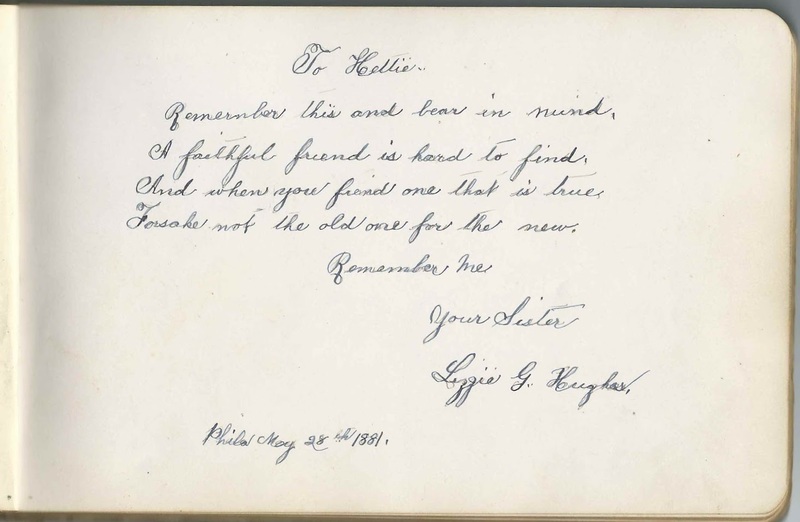 The page signed after Lizzie's was inscribed by her sister Laura Lobb. 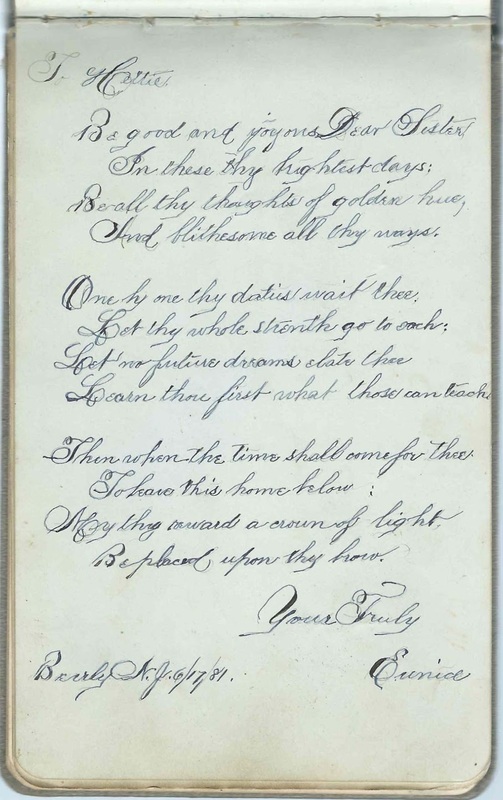 Hettie's other older brother Samuel J. Hughes inscribed a page. The "Brother Hal" who signed a page on June 16, 1881, may have been Hettie's brother Henry Hughes. 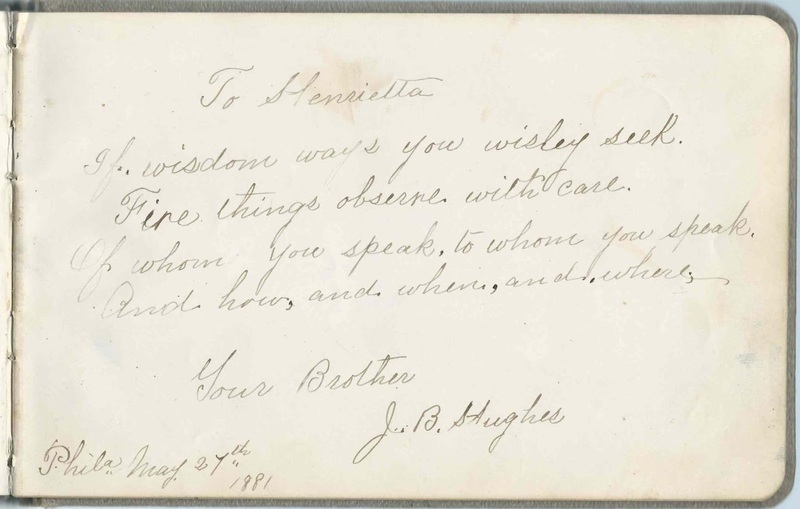 Hettie's younger sister Sarah Matilda Hughes inscribed a page as Tillie S. Hughes of Beverly, New Jersey, on June 5, 1881. The Eunice who inscribed a page at Beverly, New Jersey, on June 17, 1881, was Hettie's younger sister Eunice Hughes. About 1890 Henrietta Matilda Hughes married John Hugh Jones, son of John and Cordelia Jones. 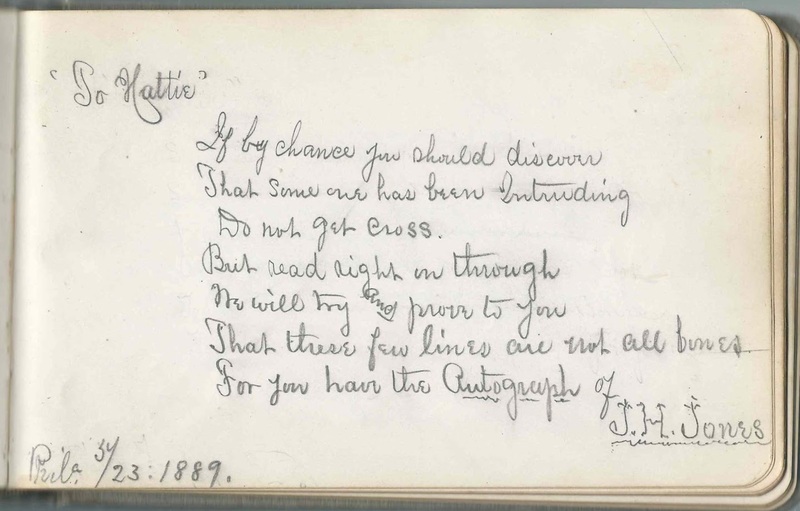 He was likely the J. H. Jones who inscribed a page upside down in Hettie's album and may have been the J. H. J. who inscribed the first page in the album. 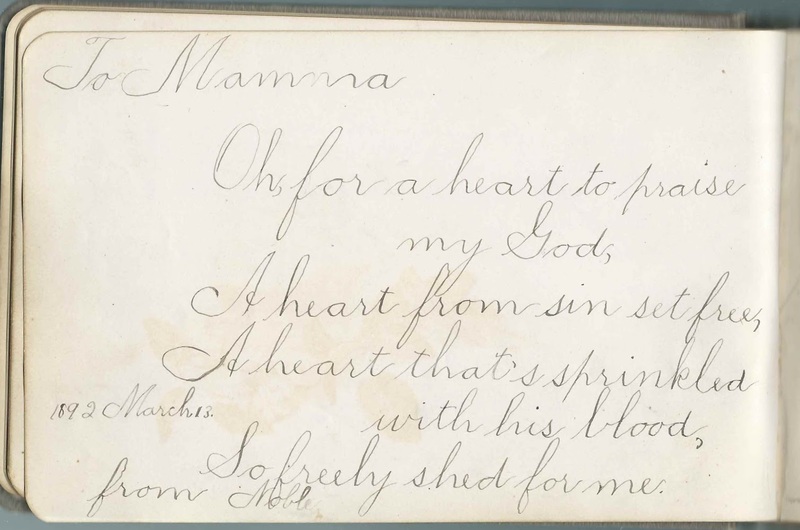 Two of Hettie's children, possibly three, inscribed pages in her album. 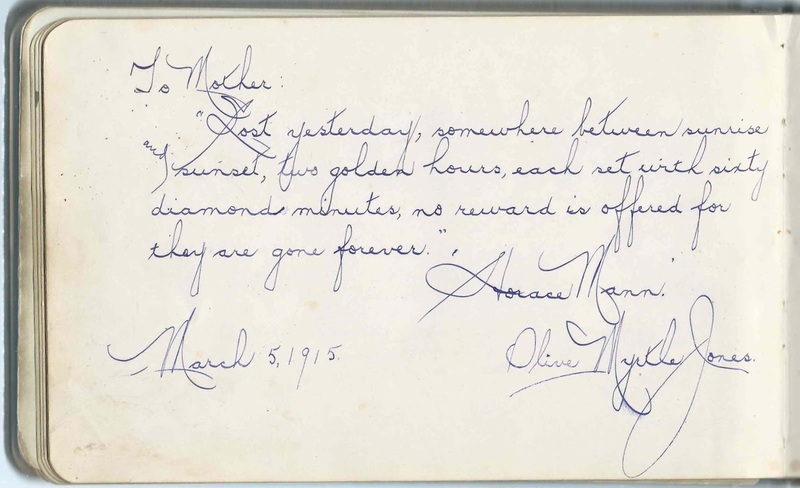 Daughter Olive Myrtle Jones and her son Robert H. Newall inscribed pages, Olive in 1915 and Robert in 1936. Hettie's son Victor Hugh Jones inscribed a page on March 2, 1915. 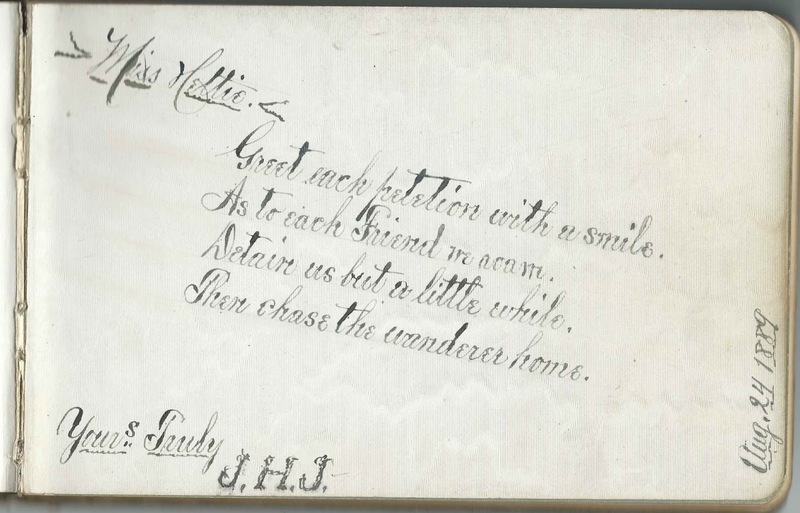 This page was inscribed by one of Hettie's children, but is not signed. Hettie's husband John Hugh Jones died in 1912. Hettie spent part of her widowhood living with daughter Olive Myrtle (Jones) Newall and family. Hettie died in 1941 at Philadelphia, Pennsylvania. D. A. S., signed at Ocean Beach, New Jersey, on "6-2-87"
Agnes Anson, signed at Norritonville, Pennsylvania, on February 9, 1883. 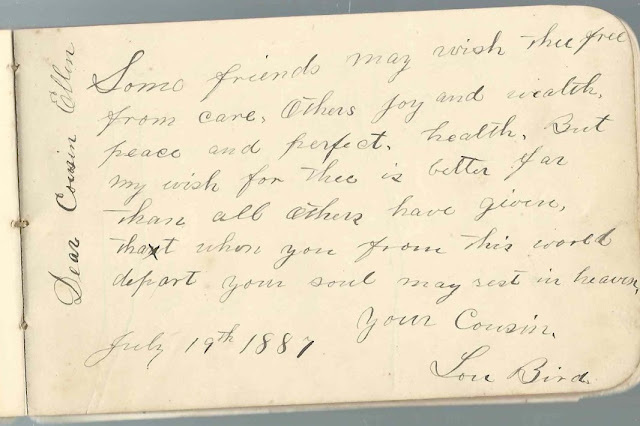 Irwin Bean of Centre Point, Pennsylvania, in Montgomery County; middle initial possibly H.
Maggie E. Eccles, signed at Philadelphia, presumably Pennsylvania, on May 26, 1881 "A Birthday Wish to Henny"
William Eccles, signed on May 26, 1881; middle initial might be P or ? Erma Eskridge, signed at City of P. L., on July 11, 1884; "Your loving roommate"
Ida V. Hartzell of 1930 Woodstock Street, Philadelphia, Pennsylvania, on May 20, 1889; check the list of signers who didn't leave a surname, as one of them gave this same address. Henrietta Matilda Hughes, "Hettie", album owner. Tillie S. Hughes, signed at Beverly, no state written, on June 5, 1881. Hettie's younger sister Matilda Hughes. Lizzie G. Hughes of Philadelphia, Pennsylvania, on May 28, 1881. Presumably Elizabeth (Lobb) Hughes, wife of Hettie's brother John B. Hughes. Eunice, signed a Beverly, New Jersey, on June 17, 1881; Eunice Hughes, Hettie's younger sister. J. B. Hughes, signed at Philadelphia, Pennsylvania, on May 27, 1881. Hettie's brother John B. Hughes. Scrap of paper pasted to inside back cover: H. Kriter, signed at Sea Plain, New Jersey, on September 27, 1885. Sea Plain is now known as Lake Como. 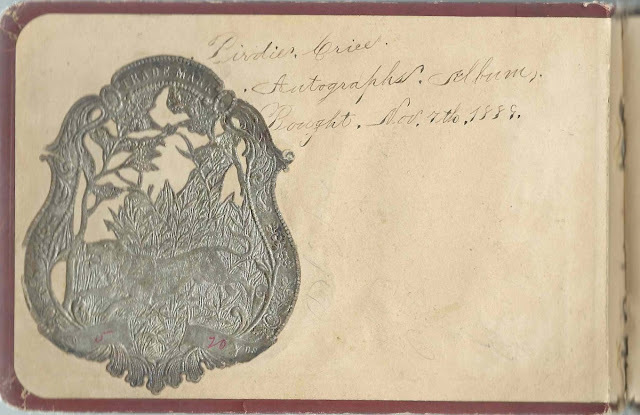 Laura Lobb, signed at Philadelphia, Pennsylvania, on May 28, 1881. She was the sister of signer Lizzie G. (Lobb) Hughes, wife of John B. Hughes, Hettie's brother. Lillie E. Moulsdale, signed on March 23, 1881, either at Abingdon, Maryland, or Lillie was from there. Robert, "your loving grandson", signed November 8, 1936. He was Robert H. Newall, son of Hettie's daughter Olive (Jones) Newall and husband George F. Newall. Hettie, by then widowed, was living with Olive and her family at the time of the 1930 Census. Florence Ross, signed at Lumberton, New Jersey, on June 18, 1881; "Your little Cousin"
Anna W. Ross, signed at Lumberton, New Jersey, on "3-4-85"
Florence, possibly Florence Ross, signed at Lumberton, New Jersey, on February 21, 1885. "Your little Cousin"
Frank A. Slocum of Sea Plain, New Jersey. Sea Plain, in Monmouth County, is now known as Lake Como. 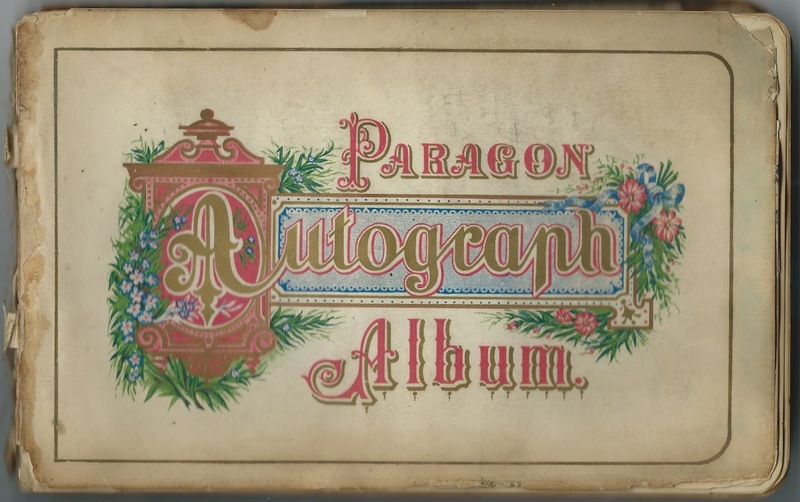 1881-1886 autograph album that belonged to Maggie H. Hoban, who may have been a student at Highland Seminary at Sing Sing, New York. In addition to Highland Seminary, other institutions mentioned by the signers include St. Elizabeth's Convent at Convent Station, New Jersey; and St. Joseph's Convent at Flushing, New York. The album, more than a bit battered, measures approximately 7-1/4" x 5" and contains the sentiments of 59 of Maggie's schoolmates and friends. An alphabetical surname list and an alphabetical list of the signers, together with any personal information they offered, appear at the end of this post. I'm not sure who exactly Maggie H. Hoban was. She could have come from the Sing Sing, New York, area, or from farther away. She may have been a teacher or a student, and Hoban may have been a married name or her birth name. If you can identify her further, please leave a comment or contact me directly. 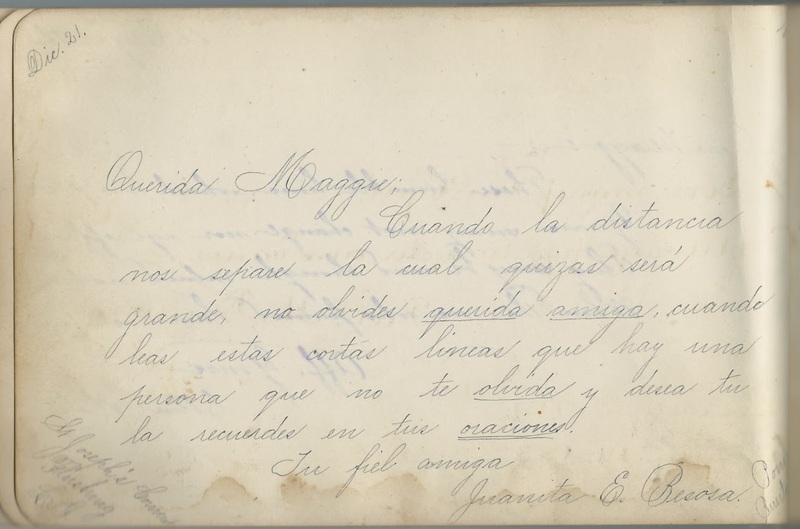 Juanita E. Besora inscribed a page in Spanish at St. Joseph's Convent at Flushing, New York, on December 21 [no year written]. Fannie Broks, who may have been Fannie Brooks, inscribed a page at St. Elizabeth's Convent at Convent Station, New Jersey, on November 3, 1882. 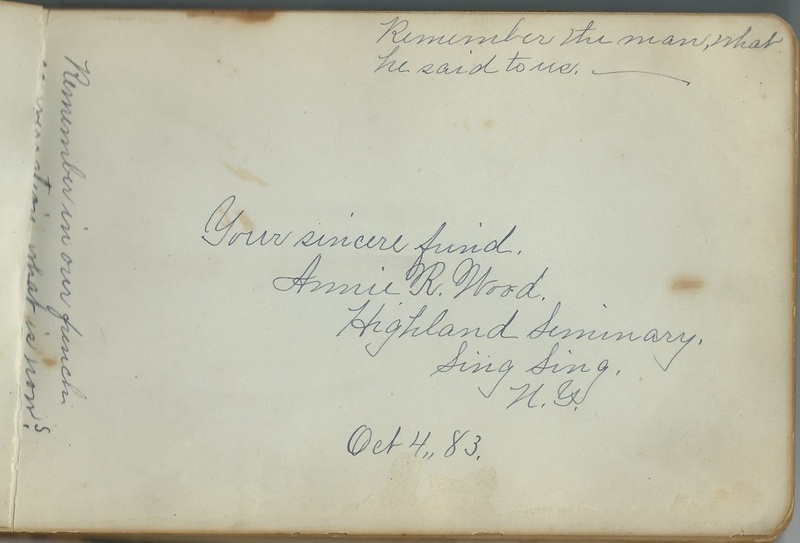 Annie R. Wood inscribed a page at Highland Seminary, Sing Sing, New York, on October 4, 1883. 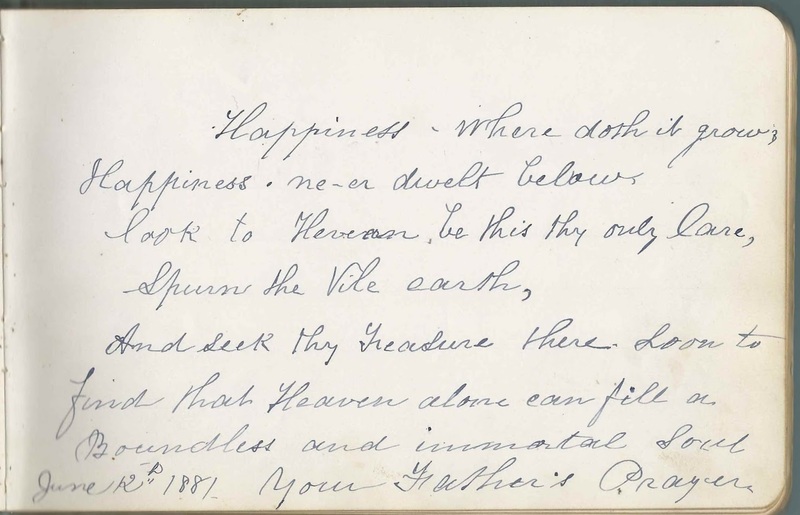 Sarah O. Peck inscribed a page at Sing Sing, New York, on May 29, 1884. Below the image of her page is a brief biography included in a 1910 catalogue of Vassar College, of which Sarah Olive Peck was an 1872 graduate. Note that her original family name was Hamlin. A Deegan Kelley R ? Sister Annie, signed on July 13, 1884. She may have been at St. Elizabeth's Convent at Convent Station, New Jersey or St. Joseph's Convent at Flushing, New York. Perhaps written by Maggie herself or a person who didn't leave a name. 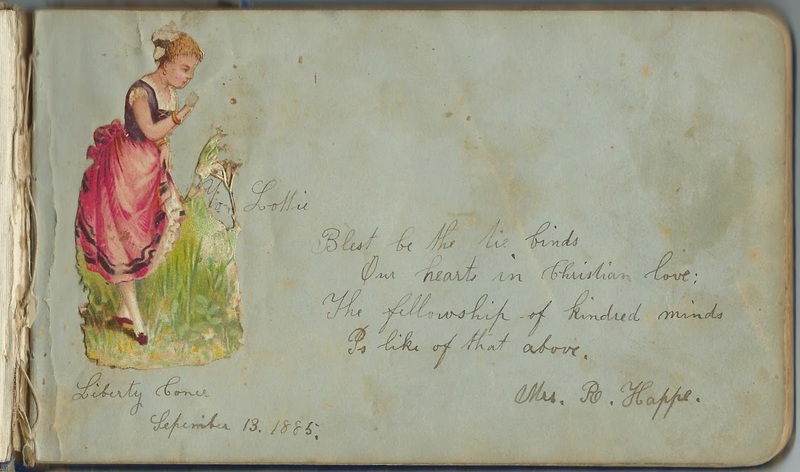 Susie, signed at Convent on March 11, 1883; perhaps at St. Elizabeth's Convent at Convent Station, New Jersey or at St. Joseph's Convent at Flushing, New York. Tinie; not sure of name. Juanita E. Besora, signed at St. Joseph's Convent, Flushing, Long Island, New York, on December 21 [no year written]. Page written in Spanish. Fannie Broks; can't decipher middle initial, and couldn't find anyone with surname Broks; perhaps she left out an o. Signed at St. Elizabeth's on November 3, 1882. Presumably at Convent Station, New Jersey. T. F. Canelly or Carney or ?. Originally the entry was T. F. C. but the signer or someone else wrote in the rest of the surname, which runs off the page. M. C. C., signed at Study Hall on June 14, 1883. First initial might be incorrect. Tessie Heshnal, signed at Convent Station on September 24, 1882. Not sure of surname. Presumably at St. Elizabeth's Convent at Convent Station, New Jersey. Maggie H. Hoban, album owner. She dated the album September 1881. Ellen Kelley, signed at St. Elizabeth's on August 3, 1882. Presumably St. Elizabeth's Convent at Convent Station, New Jersey. Sarah O. Peck, signed on May 29, 1884 at Sing Sing, New York. She was Sarah Olive Peck, born at Rochester, Michigan; teacher at Highland Seminary at Sing Sing, New York. Etta Powell, signed at Convent on June 19, 1883; possibly St. Elizabeth's Convent at Convent Station, New Jersey, or St. Joseph's Convent at Flushing, New York. Not sure of name. First initial is M. Surname could be Quinn or Quire or something else entirely that doesn't start with Q. 1885-1895 autograph album that belonged to Charlotte Christine Happe, "Lottie", of Liberty Corner, New Jersey. The album measures almost 7" x 4-1/4" and appears to be missing a few pages at the beginning, including any presentation, ownership or title pages. 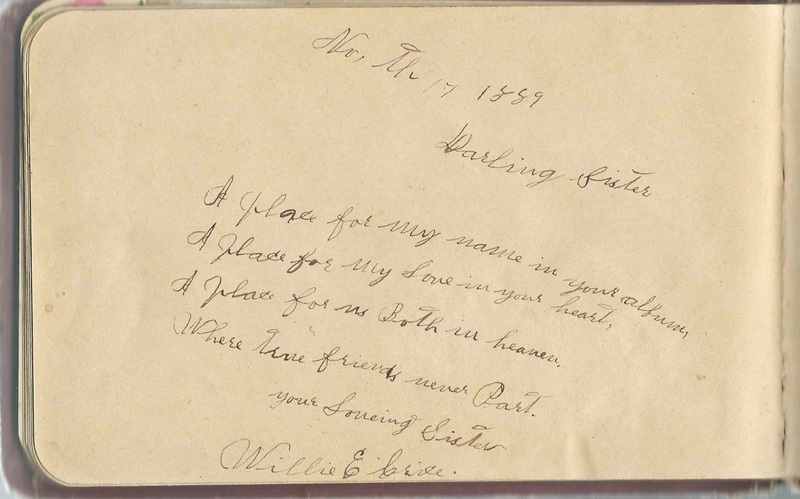 Nearly 60 of Lottie's relatives, friends, schoolmates and teachers [L. E. Layton and Walter D. Wheat] left sentiments in the album. An alphabetical surname list and an alphabetical list of the signers, together with any personal information they offered, appear at the end of this post. Two items were tucked into the album, an unidentified tintype of a young man and a four page handwritten James Whitcomb Riley poem entitled "Who Santy Claus Wuz", with the name Willard handwritten at top, presumably referring to Lottie's son Willard Earl Bach. Charlotte Christine Happe, "Lottie", was born April 11, 1872 at Liberty Corner, New Jersey, the daughter of Joseph and Charlotte (Kempmeir or Kempmyer or variant) Happe. Sadly, Lottie's mother Charlotte died September 8, 1880. Joseph then married Rosena (possibly Miller or Eckel), whose page in the album appears first in order, though not in date written. Lottie had, I think, nine full siblings and four half-siblings. Not all survived to adulthood. 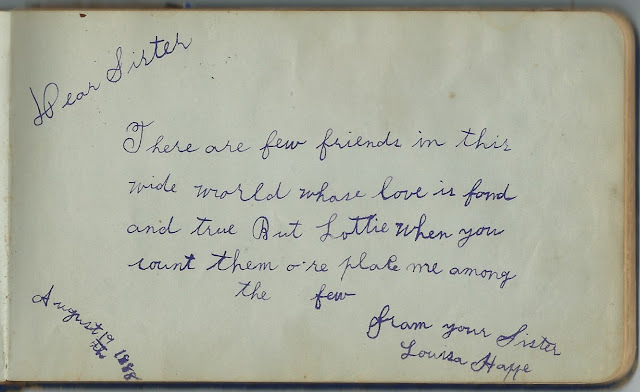 Several of them inscribed pages in Lottie's album, including full sisters Louisa Happe and Agnes Happe and half-sister Eliza M. Happe. Louisa inscribed her page on August 19, 1888. 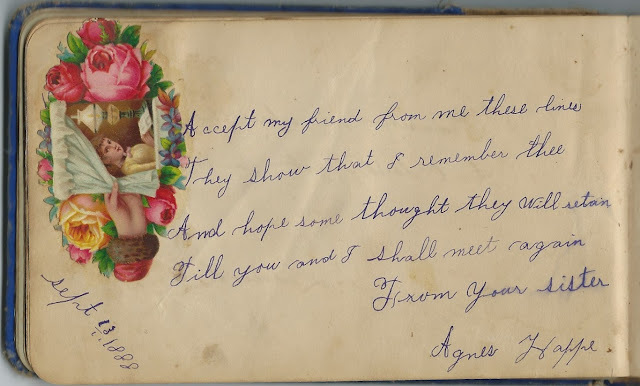 Agnes Happe inscribed her page on September 13, 1888. 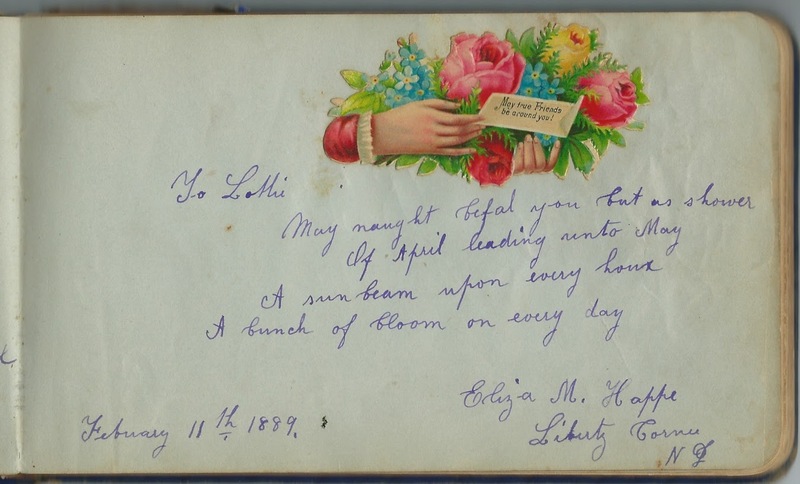 Eliza M. Happe inscribed her page on February 11, 1889. Two, possibly three, of Lottie's full brothers inscribed pages in her album. 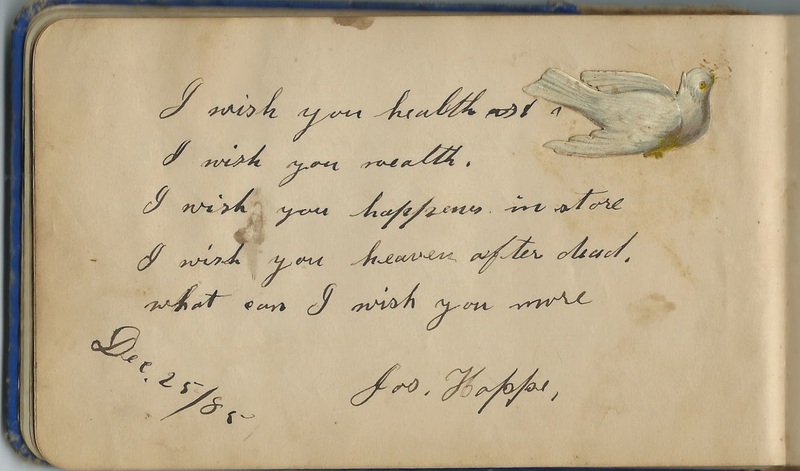 The Joseph Happe who inscribed a page on December 25, 1885, could have been Lottie's father, but presumably he would have noted that. Lottie's half brother Joseph Happe was too young to have inscribed the page, unless someone else did it for him. The likely signer was Lottie's older brother William Joseph Happe. Lottie's younger brother John Happe inscribed a page at Liberty Corner, New Jersey and dated it February 11, but didn't include a year. His sentiment was a bit cheeky but was no doubt tolerated by a doting older sister. 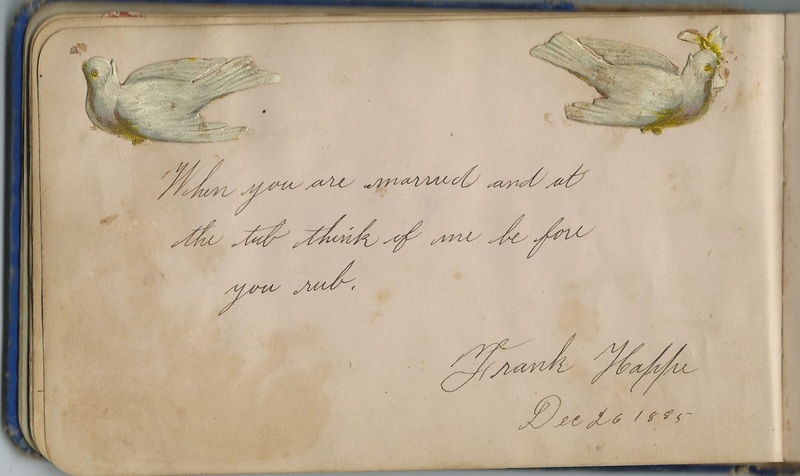 Frank Happe inscribed a page on December 26, 1885. On May 29, 1894 at Cranford, New Jersey, Charlotte Christine Happe, "Lottie", married Frederick G. Bach. They had two sons, Harold Frederick Bach and Willard Earl Bach, before Frederick G. Bach died in 1901. 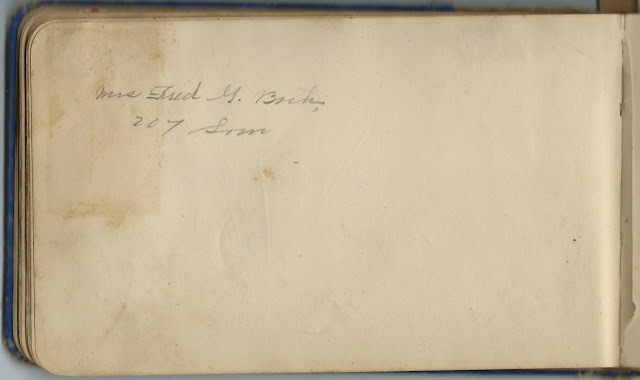 The page below might have been inscribed by Lottie herself, with her married name of Mrs. Fred G. Bach and possibly part of an address, 207 Som. [perhaps Somerset, as there is a Somerset Street in North Plainfield, New Jersey, where they made their home]. On September 29, 1903, Lottie married James Compton Foster, son of Edgar Pritmore Foster and Martha Elizabeth (Crater) Foster. Lottie and James would have four children: Helen Elizabeth Foster; Lillian Foster; Lola Rosena Foster; and James Cooley Foster. Lottie died in 1931 and James in 1950. If you have corrections and/or additions to the information above, or information on any of the signers listed below, please leave a comment or contact me directly. Addie C. Annan; signed on September 23, 1885. Later note: " 3 year after temperance meeting". Not sure of surname. Phe M. Annan, signed at "Sunnyslope", Liberty Corner, New Jersey, on September 21, 1885. Perhaps Phoebe M. Annan. but not sure of given name or surname. Two pages tucked in the album - "Who Santy Claus Wuz", with the name Willard at top, presumably Lottie's son Willard Bach. George Carr of Millington, New Jersey, signed on June 7, 1885. Perhaps the husband of Mrs. E. M. Carr who inscribed the right facing page. Mrs. E. M. Carr, signed at Millington, New Jersey, on June 9, 1885. Perhaps the wife of George Carr, who inscribed the left facing page. Lizzie A. Conklin of Liberty Corner, New Jersey, signed on January 8, 1885. 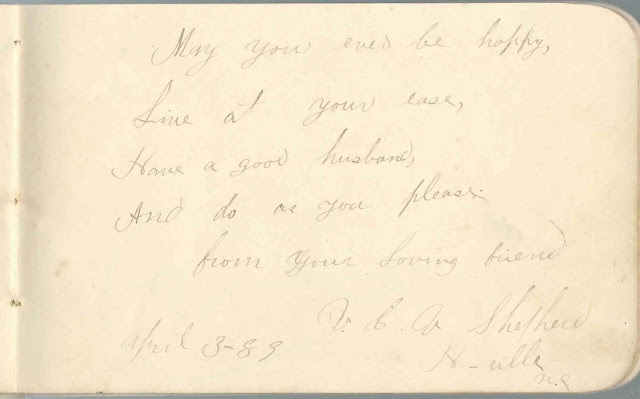 Later note: "Married July 21, 1886"
S. J. Edwards of Liberty Corner, New Jersey, signed on February 5, 1885; it was presumably his wife, Mrs. S. J. Edwards, who inscribed the right facing page. Louisa E. Fischer of Liberty Corner, New Jersey, signed on January 28, 1885; Lottie's schoolmate. Later note: "3 years later C. W. & ag"
Helen A. Graham, signed at Philadelphia, Pennsylvania, on September 10, 1885. Later note: "3 years later G. B." Mrs. R. Happe, signed at Liberty Corner, New Jersey, on September 13, 1885. Presumably Lottie's stepmother Rosena (Miller) Happe, whom Joseph Happe married after the death of Lottie's mother in 1880. 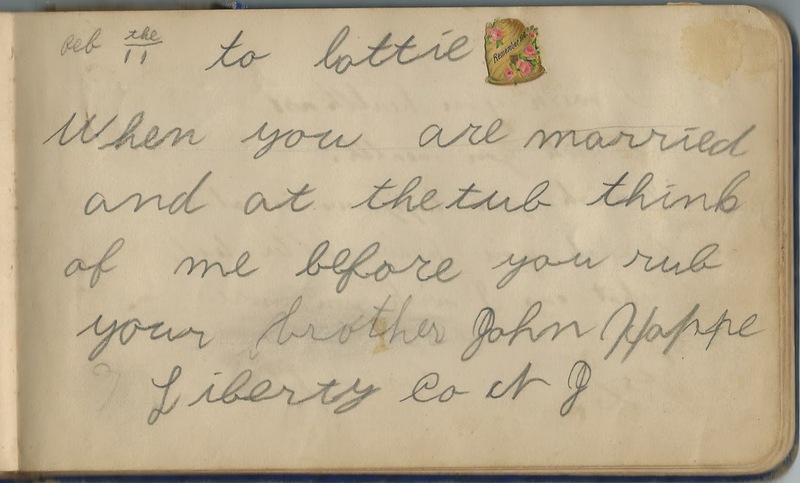 John Happe, signed at Liberty Corner, New Jersey, on February 11 [no year written]; child's handwriting - Lottie's younger brother John. 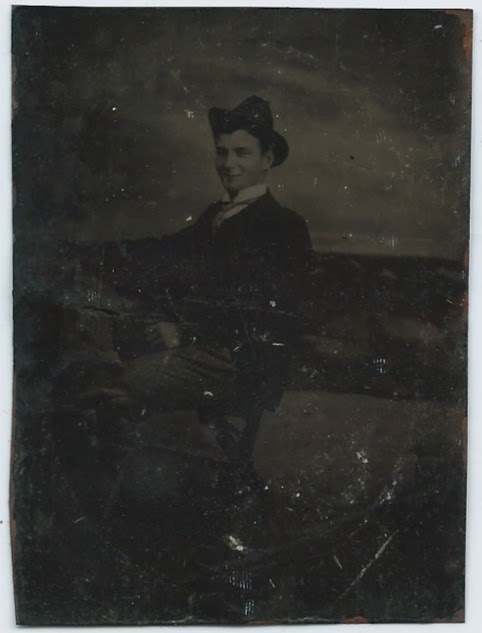 Joseph Happe, signed on December 25, 1885; Lottie's older brother William Joseph Happe. 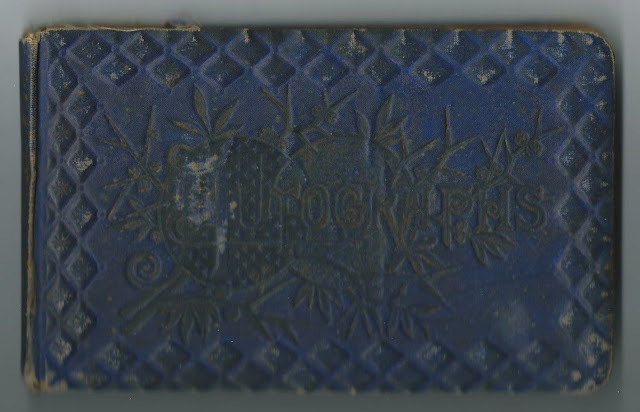 Jackie L?, signed on December 25, 1885. Surname possible Lesourd or ? 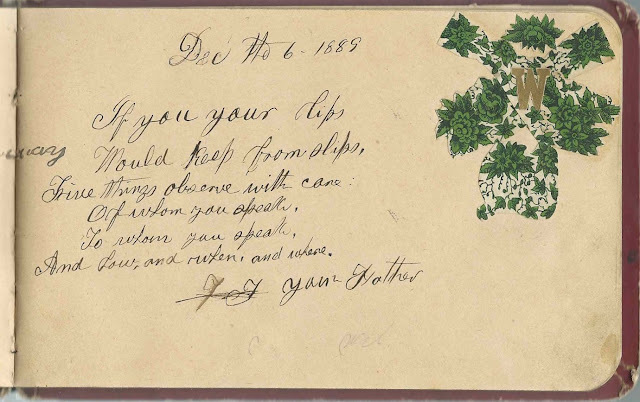 Walter D. Wheat, signed on January 22, 1885; Lottie's teacher. Later note: "Married July 21, 1886"